Greenville Technical College (GTC) and Anderson University (AU) have strengthened opportunities for students to transfer to complete a bachelor’s degree by signing bridge and articulation agreements. The Anderson University Bridge Program is intended for first-time college attendees who intend to eventually enroll at AU. Bridge students enrolled in Greenville Technical College’s Associate of Art, Associate of Science, and designated Applied Science degrees will sign an intent to transfer to AU. If they meet the minimum GPA requirement of 2.50 and earn an associate degree, they will be accepted for transfer to AU and will receive advising and academic support that will ensure a successful transition from the two-year college to the four-year university. Merit and transfer scholarships will be available for those who qualify. Articulation agreements have also been signed for the Supply Chain Management, Marketing, and Management programs. The agreements allow graduates of these Greenville Technical College programs earning a 2.50 GPA or higher to transfer 60 -62 credit hours, depending upon the program, of GTC credit to Anderson University in order to complete a Bachelor of Business Administration. “The agreements reached today will certainly benefit both institutions, but more importantly, benefit the student’s long-term earning potential and the overall economic well-being of the community at large,” said Steven Nail, dean of the College of Business at Anderson University. 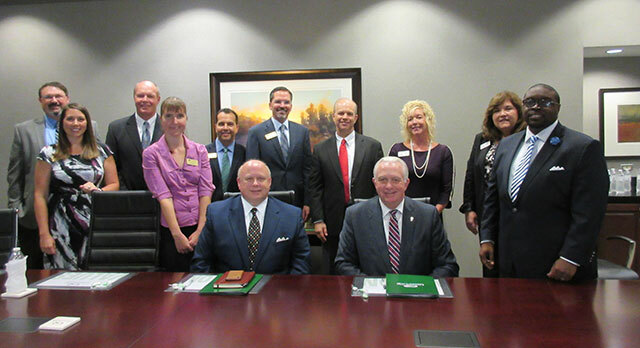 Seated are Dr. Evans Whitaker, president of Anderson University (left), and Dr. Keith Miller, president of Greenville Technical College (right), with representatives of both institutions as agreements that strengthen transfer opportunities are signed.